If you’re looking for a fun way to increase your vocabulary skills and to be able to impress your friends with new words, consider downloading Wordscapes. The game features puzzles which involves filling out crossword style grids with words formed from a couple of different letters. If you enjoy anagram puzzles, you may enjoy playing Wordscapes on your desktop. 1. There are over 5,000 Wordscapes puzzles to complete. Even if you complete dozens of anagram puzzles per day, you’ll never fun out of new Wordscapes puzzles to complete. 2. Each puzzle is increasing more challenging to complete. While you should be able to complete the first few levels without too much effort as you make your way through Wordscapes’ levels, you’ll notice that each new level will increase in difficulty. So once you get the hang of forming anagrams, you’ll still find yourself suitably challenged. If you do find yourself frustrated by a particular level, you’ll be able to use a few hints to help you complete the level you’re struggling with. Just be careful and use your hints wisely as hints are limited. As it wouldn’t be fun to play Wordscapes, if you could use hints to finish every puzzle. 4. You don’t have to worry about running out of time to complete puzzles. 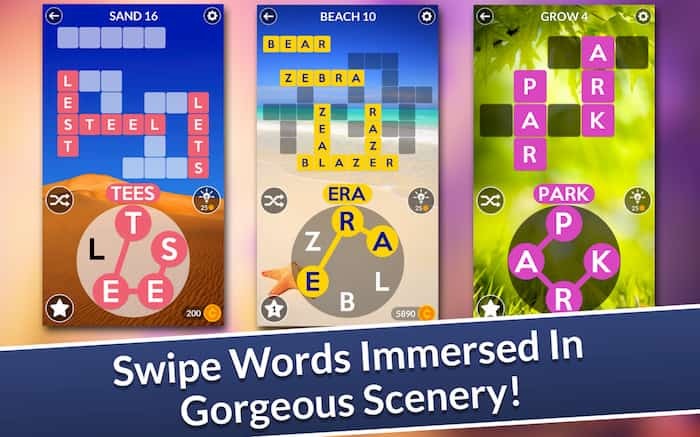 None of Wordscapes’ puzzles are timed, so you’ll be able to relax and unwind playing Wordscapes while you’re in bed or watching TV, without getting stressed out about finishing each anagram puzzle in a limited amount of time. 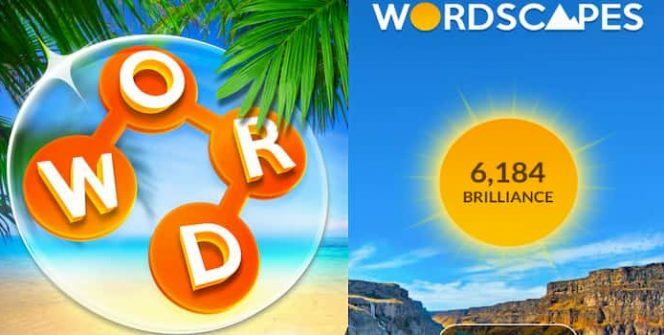 So if you prefer casual games, that are designed to be played to unwind and destress, over highly competitive games, you may enjoy playing Wordscapes. 5. You can shuffle your letters as many times as you like, without using power ups. While some other anagram style word games, force you to use hints to shuffle your letters, if you decide to play Wordscapes you’ll be able to shuffle your letters as many times as you’d like, without using any power ups. Shuffling your letters is a great idea if you’re ever stuck on a level and are struggling to find new words that may fit into your puzzle grid. 6. Each level features a unique background. Each level features a unique relaxing, eye catching background. As an example, there may be a picture perfect beach themed background on one level and a tree themed background on the next level. Part of the fun of playing Wordscapes’ is discovering brand new backgrounds. 7. It features an in game dictionary. If you come across a word that you’re unfamiliar with, you’l be able to look it up in Wordscapes’ in game dictionary. If you make a habit out of learning new words whilst playing Wordscapes, in time you’ll discover that your vocabulary has increased and that you’re able to use a far greater number of words, in your everyday conversations with your friends and family members. So if you’re interested in playing a fun, casual game that will increase your vocabulary, download Wordscapes on your PC today. Sometimes when playing Wordscapes, bluestacks ask you fee to pay but gives you option to download some apps. Every time it asks you just select “Install apps” and continue using it free. I hope you enjoyed this article, please rate and share. If you have problems running Wordscapes on your desktop or any other issues, leave a comment below.